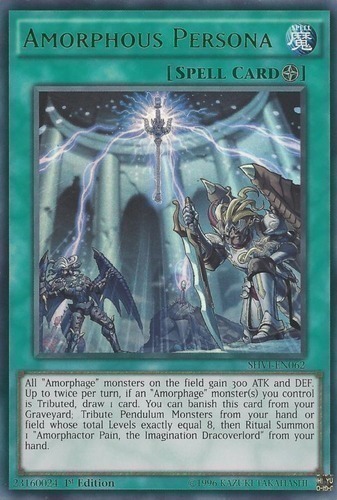 All "Amorphage" monsters on the field gain 300 ATK and DEF. Up to twice per turn, if an "Amorphage" monster(s) you control is Tributed, draw 1 card. You can banish this card from your Graveyard; Tribute Pendulum Monsters from your hand or field whose total Levels exactly equal 8, then Ritual Summon 1 "Amorphactor Pain, the Imagination Dracoverlord" from your hand.